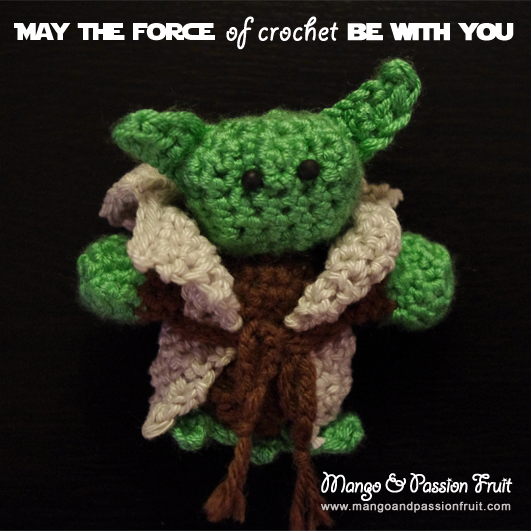 Well, you can imagine Mr. Hunter's surprise when he saw my latest crochet project... But I just couldn't help it, he is soooo cute. 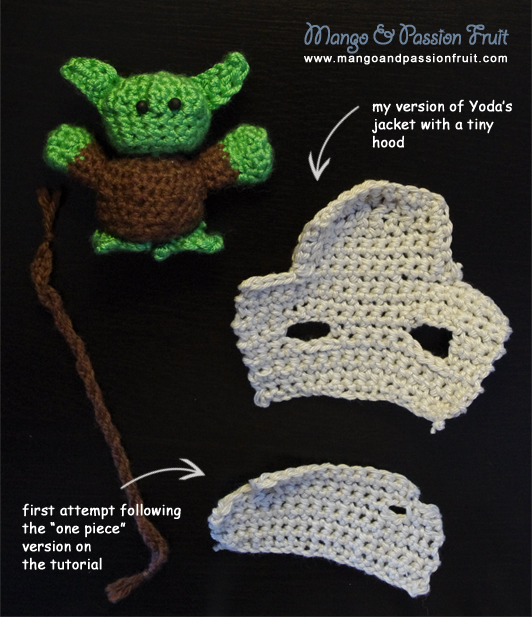 I found the tutorial at Happy Together, a simply wonderful blog run by Jessica Fediw, who not only wrote this lovely crochet pattern (US terms) but decided to share it with us! (Check her tutorials section for amazing fashion ideas). However, I found out about this particular pattern when I visited another blog, Sweet T Makes Three (that, like M&P, plays with lots of different types of craft, DIY, handmade ideas...). 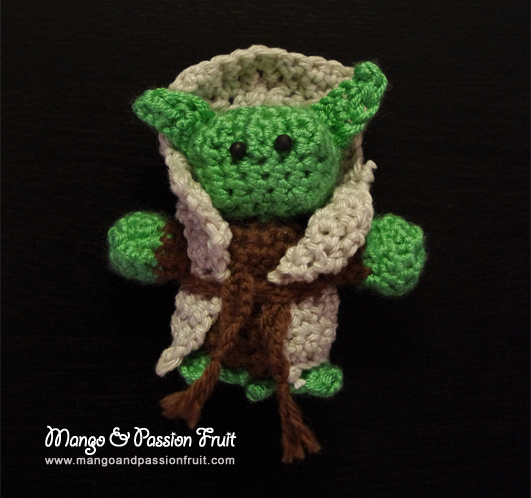 Jenn added her two cents to this project by adding "fortune cookie like" messages to Yoda's belt. To make it even more authentic, she didn't miss on any detail and wrote them as the little ancient Jedi master would say and used a Star Wars font! Below you can see my attempt. The only change I made was on the coat. I didn't want to make three pieces and join them and the option to make it as a one piece pattern ended up way too small. I also wanted it to have a hood, a bit like the one on Sweet T Makes Three. I will try to write a pattern for it, but I hope you can get an idea just by the picture below. I started from the bottom and, in US terms, I used only sc until the hood part, when I used 2 sc 1 hdc 1 dc 2 trc 1 dc 1 hdc 2 sc for the two last rows.